Danny Gregory’s A Kiss Before You Go, reviewed. A touching and beautiful goodbye, in watercolor, from a husband to his wife. Gregory’s thoughtful writing is accompanied by his stunning watercolor paintings, which are so rich and wild they viscerally convey the wide swings of emotion he and his family endured. But the book is not depressing—or at least no more depressing than life is. It’s both a celebration of the woman Gregory loved and a clear-eyed look at the work it took to clean up the messes she left behind. 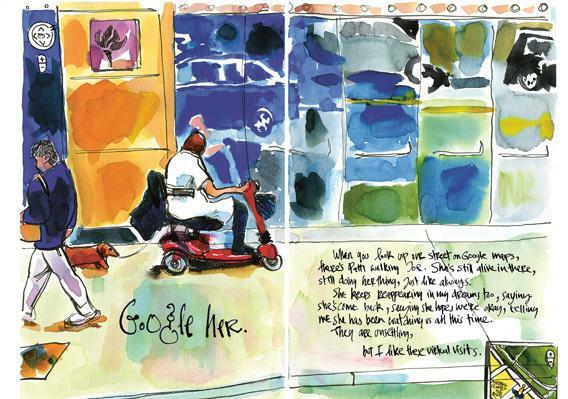 And it’s tremendously moving, perhaps no more so than on this page, on which Gregory points out that he from time to time opens Google Street View to see his wife, captured by the all-seeing eye, walking their dog down LaGuardia Place. We’re very proud to have Danny Gregory illustrating the March issue of the Slate Book Review. A Kiss Before You Go: An Illustrated Memoir of Love and Loss by Danny Gregory. Chronicle Books.